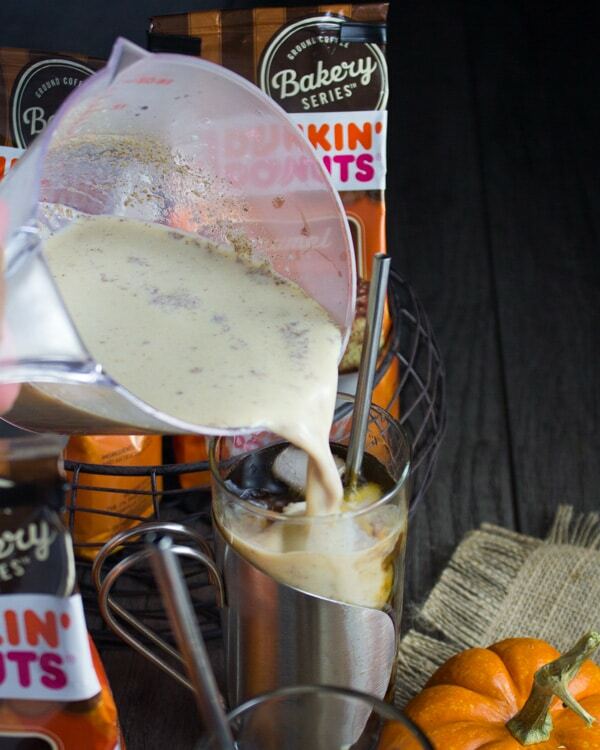 Indulge in pumpkin season with this Chocolate Pumpkin Spice Coffee Drink Recipe that’s perfectly served cold or hot. 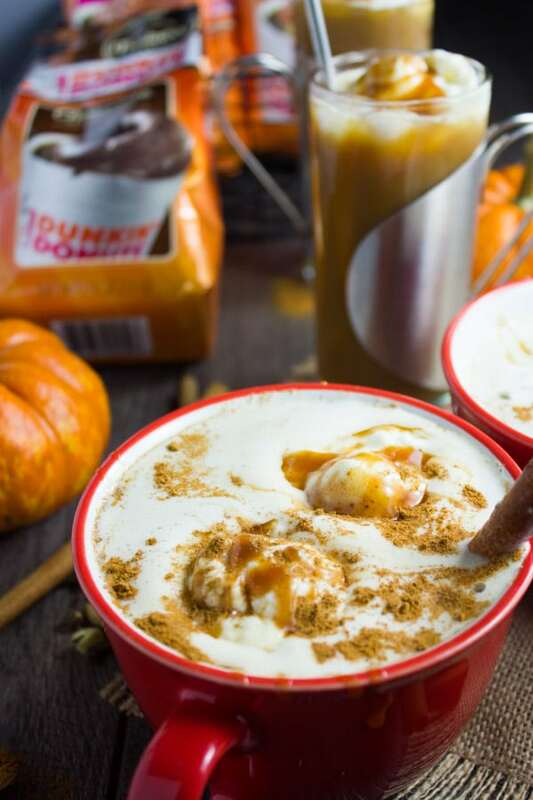 The sweetness of pumpkin, the warmth of pumpkin spice with an overload of cinnamon and a touch of sweet caramel are cooked gently with your favorite type of milk. 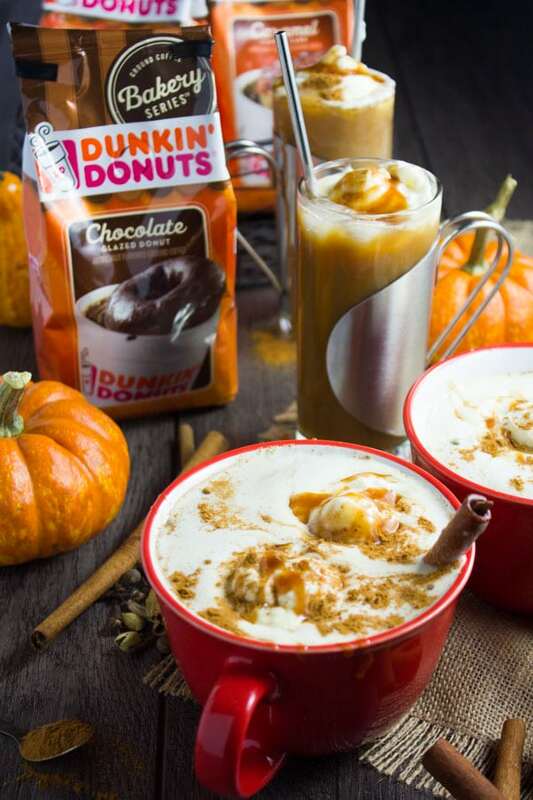 Now add this to a Chocolate Donut Flavored Coffee, top it off with whipped cream and more caramel—that’s the way a Pumpkin spiced Coffee should be!! 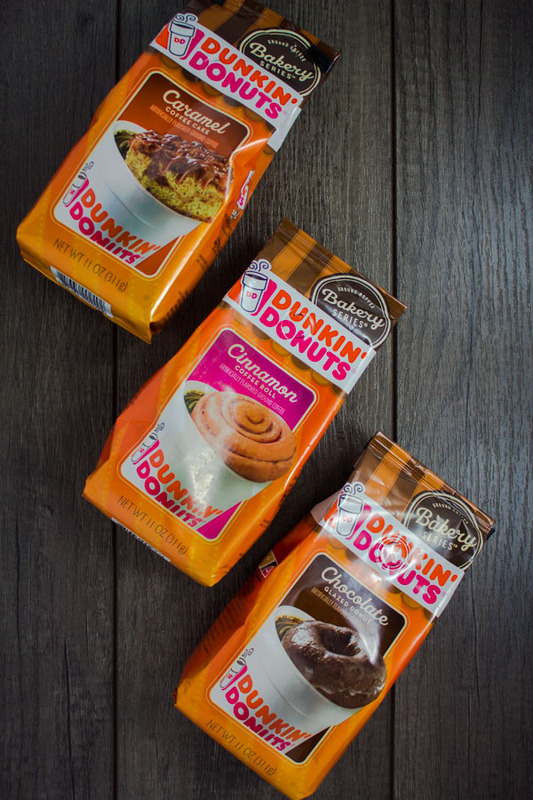 Today’s post is sponsored by my friends at Dunkin’ at Home—the makers of AMAZING coffee! Thank you for sponsoring this post! Are you all in to the season of pumpkin everything yet? I seriously can’t get enough pumpkin! And so adding it to my coffee just makes more sense, but the trick is adding it in a different way than all those pumpkin spice lattes out there—which I still appreciate, but I’m quite saturated and bored of them. 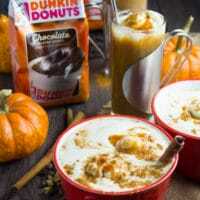 Then I discovered the amazing new Bakery Series® from Dunkin‘ Donuts®!! Oh My!! 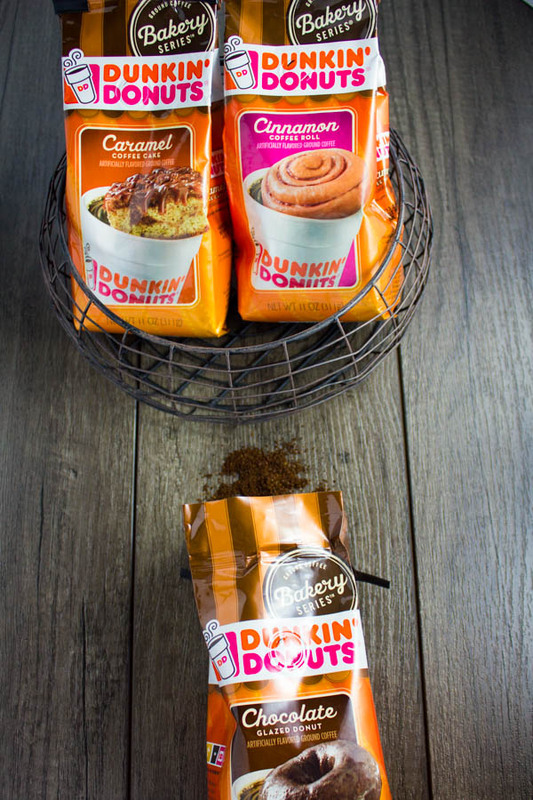 Imagine this, Caramel coffee cake flavoured coffee, Cinnamon Rolls flavored coffee, and Chocolate Donut flavoured coffee!! I mean it’s like a coffee and dessert PURE satisfaction! I tried them all and I seriously couldn’t pick a favorite, they all have that perfect coffee moment where you feel like you’re in that happy place, but each has a different mood. The best way is for you to try them out yourself—just pick them up at the coffee isle and see if you can chose a favorite flavor! I can say for example, that for this particular coffee drink recipe, I loved the Chocolate Donut flavor the most. P.S–Dear Reader, did you miss this luscious Caramel Coffee Cake Coffee Affogato dessert? I use the caramel coffee cake flavored coffee for those and they were oh so very GOOD! 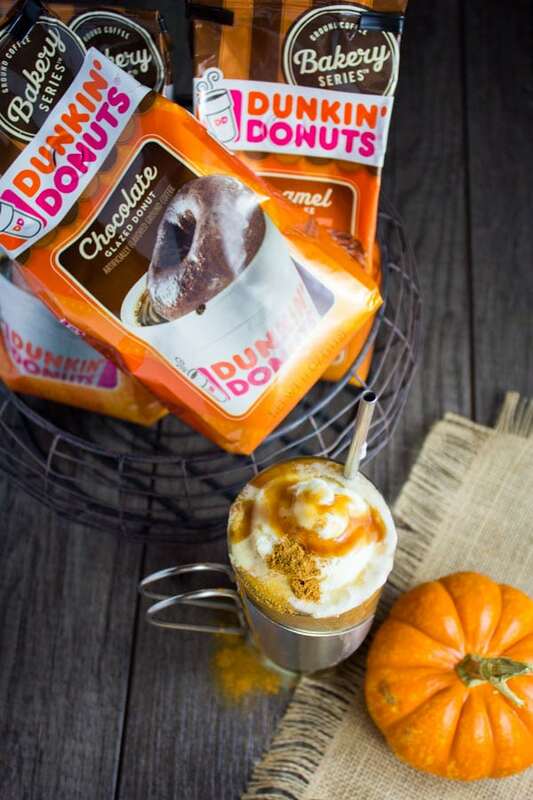 I think there’s something about the combo of pumpkin and chocolate that’s irresistible. Maybe like the banana chocolate combo. 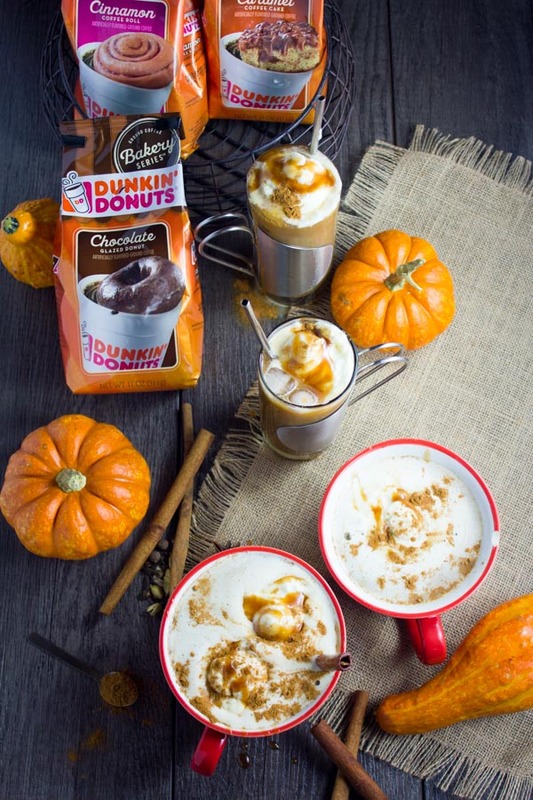 The sweetness of pumpkin pairs wonderfully with the chocolate. And the pumpkin spice adds an extra kick. I personally love to up my cinnamon level when I’m making anything with pumpkin spice—that’s a taste thing. I just feel the cinnamon accentuates the pumpkin sweetness more than anything else. So I’ve done that here, but feel free to use less of it. The beauty of this coffee drink recipe is not just how crazy delicious it is, but also how versatile it can be. So like I mentioned, the way you spice the pumpkin is totally up to your taste. You can use a ready made pumpkin spice, you can make your own or you can make your own with a personal touch. And I’ve used canned pure pumpkin (you can also make your own from scratch) which gets cooked for 2 minutes with spice and milk. When it comes to the milk, any type works beautifully here! regular, fat free, soy, almond, coconut or your favorite! So this coffee drink is easily made Vegan friendly too. Now another thing, if you’re having a nice warm Fall, then this recipe is great served cold. All you do is use really cold coffee, with coffee ice cubes, cold pumpkin-milk mixture and enjoy! If you want this to be more of a frappuccino style drink, then just blend the ice with the coffee and milk into that thick texture. 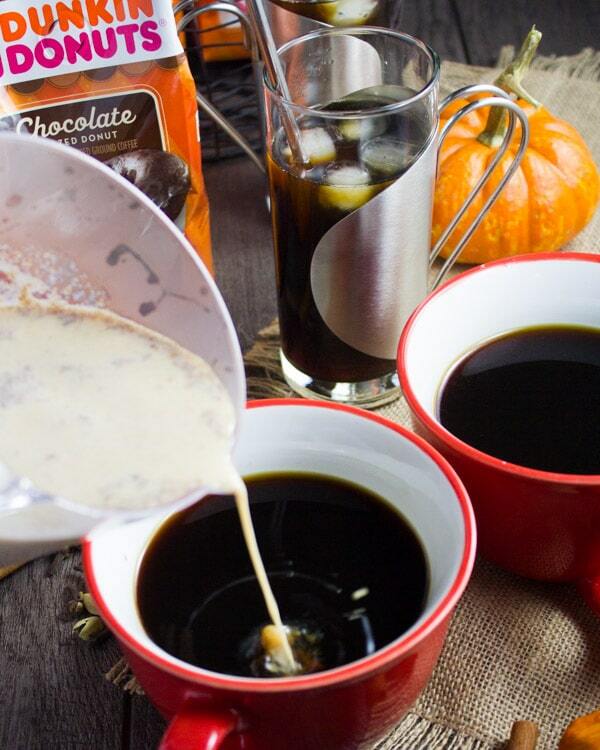 And if you’re having a chilly Fall weather, then this coffee drink is pure comfort served hot! 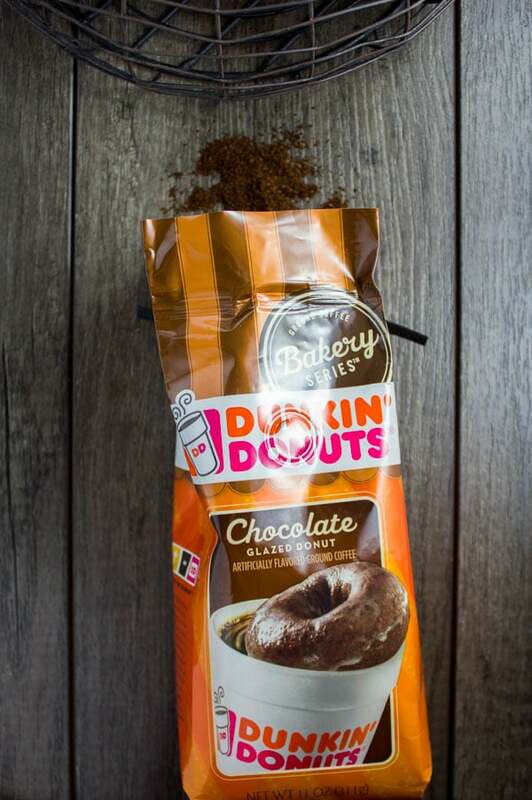 8 cups of brewed Dunkin' Donuts® Bakery Series® Coffee (**cold brew or regular), any flavor—I used the Chocolate Donut flavor. 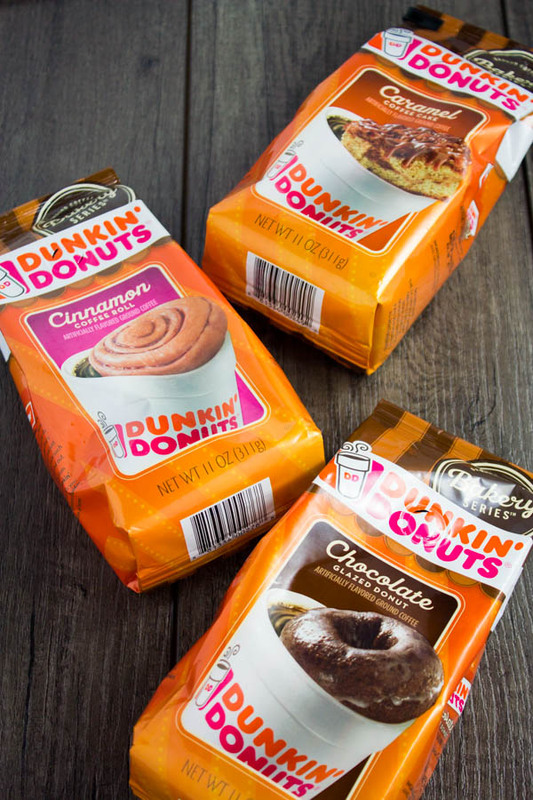 Brew your Dunkin' Donuts® Bakery Series® Coffee to your preference **cold brew works perfectly well with them too. If you’re making this coffee drink cold, remove 1 cup from the brewed coffee and chill the remaining coffee. Take the 1 cup of coffee you et aside and fill in your ice cube tray with is. Chill until it forms coffee ice cubes. Make the Pumpkin spice mixture by cooking the pumpkin and spices over medium heat for 3 minutes, stirring frequently until most of the water has evaporated form the pumpkin and the spice cooks in the pumpkin. Add in the caramel and milk and stir for another minute. If serving the coffee drink cold,, chill the milk mixture too. To serve hot or cold: Pour the brewed coffee into serving cups, and top with the pumpkin-milk mixture (about 2-3 tablespoons per cup—more or less to your taste). Top the coffee drink with some whipped cream and caramel sauce if desired. I grew up in New England and Dunks is the go-to coffee. Now my mom sends me it to Texas. This looks SO GOOD! Thanks Ashley! So true!! You’ll need to ask your mom to send you these new Bakery Series flavors–they’re UNBELIEVABLY divine! 🙂 Enjoy! 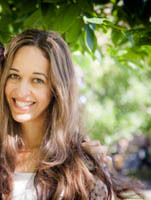 Tina–You NEED to pick them up!! 🙂 I absolutely love them and I know you’ll do too!